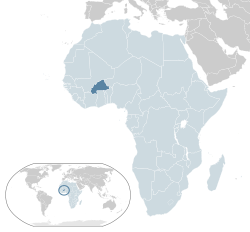 People have lived in the area of Burkina Faso for thousands of years. At first, they were hunter-gatherers, hunting animals and collecting fruits and vegetables. Later they became farmers. People called the Mossi arrived between the 11th and 13th centuries. They ruled the area until the end of the 19th century. In 1896 France beat the Mossi kingdom and became the colonial rulers of Burkina Faso. After World War I, the country was called Upper Volta. In 1960, Upper Volta became independent from France. The first president of the new country was Maurice Yaméogo. After he became the president, Yaméogo banned other political parties. For several years the people of Upper Volta were very unhappy with the government and in 1966 the military took over in a military coup. In 1983 the government was taken over again by military men called Thomas Sankara and Blaise Compaoré. Sankara became president. In 1984, he changed the name of the country to Burkina Faso. It means "land of honest people". On 28 October 2014 protesters began to march and demonstrate in Ouagadougou. Compaoré was ready to change the constitution and extendhis 27-year rule. On 30 October 2014, some protesters set fire to the parliament. They also took over the national television headquarters. On 31 October 2014, President Compaoré, resigned after 27 years in office. In 2015 the country held their first election. Roch Marc Christian Kabore, a former Prime Minister, was elected as President. The food of Burkina Faso, typical of west African cuisine, is based around staple foods of sorghum, millet, rice, maize, peanuts, potatoes, beans, yams and okra. The most common sources of protein are chicken, eggs and fresh water fish. ↑ 1.0 1.1 "Roch Marc Christian Kabore elected Burkina Faso president". BBC. 1 December 2015. Retrieved 30 October 2016. ↑ "INSD Burkina Faso (French)". ↑ 3.0 3.1 3.2 3.3 "Burkina Faso". International Monetary Fund. Retrieved 21 April 2011. ↑ 6.0 6.1 Peoples of Africa, Volume 2. Marshall Cavendish. 2001. p. 51. ISBN 076147160X. ↑ Kingfisher Geography Encyclopedia. p. 170. ISBN 1-85613-582-9. ↑ "BBC News - Burkina Faso parliament set ablaze". BBC News. Retrieved 31 October 2014. ↑ "Burkina Faso protesters set parliament on fire, take over state TV and march on presidency". The Sydney Morning Herald. Retrieved 31 October 2014. ↑ Taoko, Hervé; Cowell, Alan (31 October 2014). "Burkina Faso's President Resigns, and General Takes Reins" – via NYTimes.com. ↑ Marchais, Julien (2006). Burkina Faso (in French). Petit Futé. pp. 91–92. ISBN 2746916010. ↑ "Oxfam's Cool Planet – Food in Burkina Faso". Oxfam. Retrieved 21 May 2008.